Reviewing a console at its launch is always a somewhat fruitless endeavor. It can take years for a game system to establish an identity, and in our age of endless software updates and hardware upgrades, that’s not even guaranteed to last. (Just ask Microsoft.) What you’re assessing is merely a foundation, the untapped potential of a base that games and fixes will build upon for years to come. Nintendo’s Switch is an especially empty vessel. In my 10 days with the system, I’ve only had two games to play on it—The Legend Of Zelda: Breath Of The Wild, a massively ambitious and breathtaking adventure, and 1-2-Switch, a party game that’s a great showcase for the system’s more whimsical controller functions but in no reality should cost $50—and none of the console’s online functionality is active, nor has Nintendo even bothered outlining it in detail. There’s no reason to mince words; unless you never bought a Wii U and you’re absolutely dying to play Zelda: Breath Of The Wild, the smart thing to do right now is the same as during any console launch: wait and see how the Switch’s first year pans out. So instead of pointlessly speculating about what that year will be like or gracing you with yet another entry in the endless parade of identical point-by-point consumer reports, I’d just like to share my thoughts on what it’s been like to play games on a Nintendo Switch for the past week-and-a-half. We will revisit and reassess the console as its features and library begin to take shape, but for now, I feel an earnest personal report is more worthwhile. This might sound crazy coming from someone whose job it is to think and write about video games, but I feel like I hardly ever play them these days. If it’s not one of the few I’m reviewing, chances are I’ll only ever get through a bit of it or, more likely, never touch it at all. It wasn’t always that way. Mine is a pretty common story. I used to burn through all the lengthy big-budget releases and buzz-worthy bite-sized indies I could afford, which was a lot, considering I mostly rented everything from Gamefly. My passion and appetite for video games was endless, fueled in part by a need to constantly keep up with the lightning-fast zeitgeist of internet conversation. That passion hasn’t gone away, but I’m frustratingly unable to satiate it. The reason is obvious: I “grew up.” I got a job that, yes, involves playing games, but where that’s a small fraction of my actual responsibilities. I share a small apartment with my partner, and I’m not about to demand dominion over the living room—pretty much our only room—just because I feel like sinking another three hours into some over-long open-world game I’m barely enjoying while she’s forced to do something else, alone. I just don’t have the time to gobble up games like I used to, and even still, I’m blessed to have the time and library that I do. We have plenty of readers who are parents, for example, and who are trying to hold onto a beloved pastime that requires investments, both physical and monetary, that are antithetical to raising a family. If I’m feeling disillusioned and disconnected from this medium I care so much about, I can’t even begin to imagine what their experience is like. I’d never be so hyperbolic as to call the Nintendo Switch “life-changing,” but using it to play Zelda: Breath Of The Wild is the first time in a while I’ve felt like making the kind of connection I used to have with gaming is still possible. The console has plenty of flaws, big and mostly small, but its core function works beautifully. Being able to go from playing a game on a TV to playing it on a screen in your hands without sacrificing much by way of quality is an enticing sales pitch, but in practice, it has proven to be far more revelatory than I had ever imagined. This all hugely obvious, I’m sure, but until I actually started playing the Switch, I didn’t grasp just how nice it would be to have a single game seamlessly woven into my daily life like that. Suddenly, there’s time to play where there wasn’t before, and I don’t have to choose between a full-on TV game and a less disruptive handheld or mobile game. And Breath Of The Wild really is the perfect launch game to cement this. If 1-2-Switch is a fun yet limited proof of concept for the oodles of stuff built into the Joy-Con controllers, Zelda is the proof of concept for the system itself. It’s so massive and difficult to pull yourself away from that it demands to be lived in and lived with. Right now, it’s the only game I want to play, and with the Switch, I have more opportunities to do just that. As I’ve noted before on this very website, Switch-like technology has existed for a while. Nintendo’s own Wii U was a step in this direction, but not every game offered the ability to play using the rudimentary screen on its chunky controller instead of the TV. Even when a game did, you couldn’t take the Gamepad out of the house and keep playing. Sony’s PlayStation 4 to PS Vita Remote Play lets you access your console anywhere that wi-fi is available, but that utilizes fickle streaming technology and unless you have a stellar connection, you’re bound to run into hiccups. The same goes for Nvidia’s Shield tablet. The Switch doesn’t carry any of those woes because the tablet is the console. In fact, as spending time with Breath Of The Wild demonstrates, if you’re going to run into technical issues anywhere, it might actually be while playing on a TV, since Switch will automatically increase the resolution of the visuals it’s pumping out and can’t keep up with that new benchmark 100-percent of the time. The Switch, like any console, is not a perfect piece of hardware. Its kickstand is flimsy. Its controllers are a bit cramped. Its accessories are numerous and pricey. 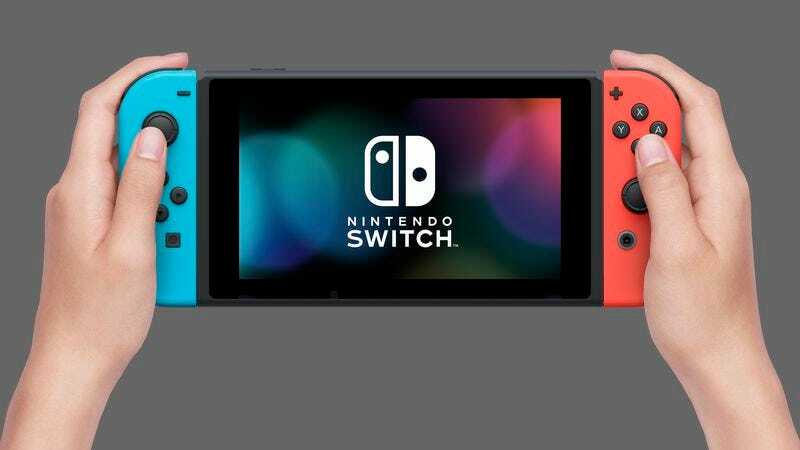 And the widespread Joy-Con connectivity problem, which sees the affected controllers occasionally losing your button presses when you’re playing through the dock, is enough to dissuade anyone from buying one until Nintendo is willing to make a statement about whether it can be fixed. All those things considered, I’d never advise running out and buying one on Friday, but I can honestly say it’s the first device since the iPhone that has changed the way I play games. That ability to stick with a single experience, no matter what I’m doing or where I am, is worth a heck of a lot, so much so that I can’t help but feel I just want to play everything on the Switch now. Unfortunately, that’s not going to happen. Most blockbuster games will never appear on the console and Nintendo has a lot of work to do to prove it can flesh out the system’s library beyond its own superlative releases. Earlier this week, it announced dozens of promising independently developed games that will be released for the new console, and that’s a great start. The Switch will never be perfect for everyone, but should Nintendo maintain that momentum, it just might be perfect for me.